The owner’s old house was fully demolished and the new house is currently being constructed. 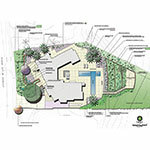 Scope of work includes landscape architectural services for the landscape of a new & modern private residence. Special features include the protection of existing cacti & succulent plants during house demo & construction and their incorporation into the landscape design & installation.